What’s your reaction when you’re asked to give feedback? I expect it’s that unpleasant feeling when you feel obliged to do something, but would rather not. Most of us don’t like giving feedback. Somehow there is a negative element associated with it. However, we need feedback. Others need it too. Giving it to others helps them see their blindspots. Without it, you keep going in circles knowing that something is wrong but not sure why, when or how to fix it. Feedback is designed to help others not only see the mistakes they’re making but also shine some light on how they can improve things. At its best, feedback is like a sounding board. It’s not judgmental or offensive. But it does give you a fresh insight, a new way of looking at things. So, let’s look at how to give useful feedback, and not feel awkward about it. The worst – and least helpful type – of feedback is when people criticize something because of feelings. It doesn’t feel right? If you work in the design world, you’ll often hear this. So how do we get around it. For example, instead of saying, ‘that web design doesn’t work for me’, explain where it doesn’t work. The problem here is that subjective feelings are just that, subjective. Unless you can offer something more objective, for example, research or best practices that support your argument, it’s hard for the other person to guess what you want. You see this a lot in other industries, where feelings and personal taste often dictate the design process. If someone asks for feedback, don’t keep them hanging on. Arrange a session, agree to meet, and be prepared. If you know that you will not be giving them feedback, or don’t intend to give any ‘honest’ feedback, then decline the offer and let them find someone else. But don’t keep them waiting. The other person is counting on your feedback and could have asked someone else. They asked you. If you agreed, then meet up. When I hear this, I know there’s trouble coming. It’s a common prefix to personal criticism dressed as something else. The ‘honest’ implies you need to hear what’s coming at you, but in general, it’s a nasty way to deliver feedback. The intention is usually to hurt the other person. Honest opinions are often seen as a type of tough love. Something you need to hear. Maybe the other person likes the drama, the intensity. So, when you’re designing e-learning courses, try to construct feedback that reinforces your learning objectives and helps learners retain more information. Stay within the perimeter of the software, course, or service you’ve been asked to review. Don’t say that it would be better IF something else had been added. That’s side stepping the issue. What in the product or service you say did you not enjoy. Give an example of a similar product and how it was better or worse. Don’t patronize the other person with this. If you disagree with something, just say it. They’re adults. You don’t have to sugar coat everything. Agreeing to disagree is simply a way to stay PC and avoid making any comment that might… might possibly offend the other person. Instead, get to the point. Avoid rambling and offer your feedback in ways that helps the person improve and build upon their skills. 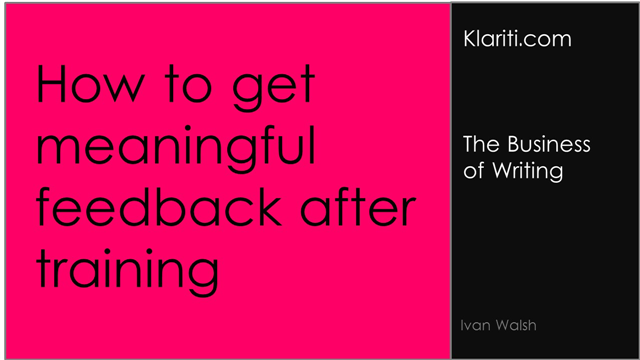 After giving the feedback, is the person better equipped to go forward and improve how they do something? If not, maybe your feedback was simply criticism in disguise. One way I approach this is to see the feedback process as a way to deepen my knowledge, to improve my communication skills. It’s a challenge for me. If you look at feedback as an opportunity to strengthen your own communication skills, then it becomes an interesting exercise. How can I explain this as clearly as possible without being misunderstood? How can I be sure they’ve understood my point clearly? What example, analogy, or story can I share to help clarify my point? Try to be sensitive to the situation—especially for feedback about an incorrect answer. Instead of saying WRONG!, present feedback in a neutral way that doesn’t make your learners feel like they are stupid for getting it wrong. Focus your feedback on behaviors that can be changed, not personality traits. Connect the feedback with their job and how it will help them perform better. It doesn’t all have to be doom and gloom. Feedback doesn’t have to be negative. See it as a way to help the other person deepen their understanding. Put yourself in their shoes. What’s the one thing they really need to know? Share this the way you would with a friend. Feedback is a great teaching opportunity. If you follow these guidelines for sharing feedback, you’ll improve your training courses and allow your students to progress faster.